The city of Chicago has signed an “agreement in principle” to negotiate a consent decree with the federal government that would give the embattled Chicago Police Department federal oversight to enact sweeping reforms. Document: Read the DOJ report The DOJ’s report cites systemic failures in the department, including “severely deficient” training of police officers, an oversight process that lacks accountability and fails to investigate most police misconduct cases, even though it is required to do so by law. The report also alludes to a code of silence within the department, a promotions system that the rank-and-file officers call “political” and “unfair,” a failure to address racially discriminatory conduct, and a pattern of officers making tactical decisions that put themselves and others needlessly in harm’s way. U.S. Attorney General Loretta Lynch said the report found that the Police Department had not only failed its residents, but individual police officers as well. “With this announcement, we are laying the groundwork for the difficult but necessary work of building a stronger, safer and more united Chicago for all who call it home,” she said. 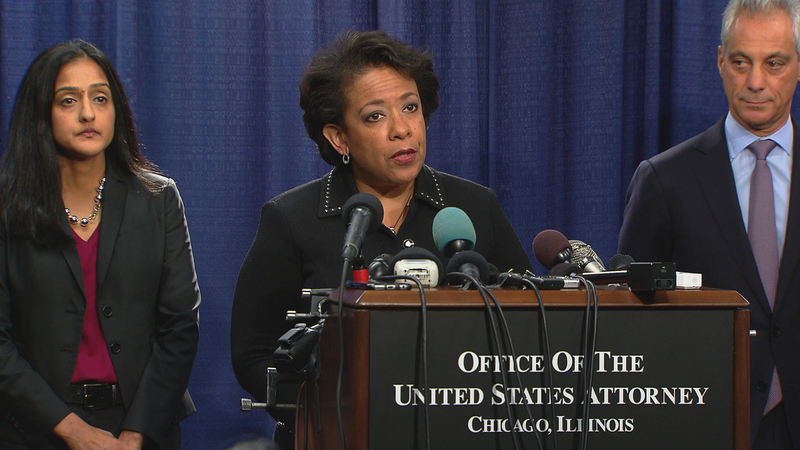 Lynch announced the results of the 13-month investigation Friday morning at the Dirksen Federal Building, flanked by U.S. Attorney for the Northern District Zachary Fardon, Mayor Rahm Emanuel, Police Superintendent Eddie Johnson and Sharon Fairley, the chief administrator of the Independent Police Review Authority that is transitioning into the new, more powerful Civilian Office of Police Accountability. The investigation took on added urgency following the election of Donald Trump, and the concern that his administration might shelf the results or take a different approach. Trump’s Attorney General-designate, Jeff Sessions, has indicated his lack of support for federal consent decrees, and the administration at large has signaled a more pro-police stance. Despite this, Emanuel said Friday that he would commit the city to making “necessary reforms” to the department. Though Lynch and Vanita Gupta, the head of the DOJ’s Civil Rights Division, will be leaving Chicago at the end of this week, they stressed that most of the career lawyers and civil servants in the department will stay on to negotiate the agreement. Several observers familiar with the process of negotiating federal consent decrees have said it can still have teeth even if the Trump administration chooses not to prioritize it. Lori Lightfoot, chairwoman of the Chicago Police Board, says local civil rights attorneys can bring the heat by suing the city on behalf of individual plaintiffs who feel they were treated in a manner that the DOJ report condemns. That pathway alone could lead a federal judge to appoint its own independent monitor to oversee changes to the department. “If the city doesn’t take tangible, direct actions to address those systemic problems, it is opening up the city to huge liability, and the taxpayers are going to be the ones that’ll be the victims then,” Lightfoot told Chicago Tonight. The report commends the mayor and city for being “committed to reform” and already taking “promising steps” to change the culture of the department. It lauds the creation of the new Civilian Office of Police Oversight, which will have expanded resources and powers to conduct investigations into police misconduct. It also gives credit to the city’s new policy of releasing videos of police misconduct, and supplying every patrol officer with body cameras. The report, however, calls for better de-escalation and crisis intervention training for police officers. Superintendent Johnson told reporters Friday that he is committed to carrying that out. The report’s findings are the results of the largest civil rights investigation into a police department ever conducted by the DOJ. It was initially announced in December 2015, in the immediate aftermath of the video release of the Laquan McDonald shooting. The Department of Justice says that it heard from over 1,000 community members and more than 90 community organizations, and analyzed investigative files for incidents that occurred between January 2011 and April 2016, including over 170 officer-involved shooting investigations and documents related to over 400 additional force incidents. Lynch says that many of the problems and recommendations in the report came from police officers themselves. But she says that, despite efforts to reach him, former Police Superintendent Garry McCarthy was unavailable. McCarthy, who has been a ubiquitous presence on local and national media in recent weeks, called that assertion a lie, and complained in recent days that he had not been interviewed by the DOJ. The report outlines several factors that led to its conclusion of a systematic, unconstitutional use of force. It concluded a pattern of unreasonable use of force against fleeing subjects that presented no immediate threat, unsound practices in approaching vehicles with possible perpetrators, poor discipline in discharging weapons, and repeated instances where cops needlessly put their own lives and the lives of others in danger. Mentioned briefly in the report, but not at Friday’s press conference, is the role that the Fraternal Order of Police labor contract with the city plays in the lack of properly disciplining officers. The report cites the contract as one of the reasons it is so difficult to charge an officer with a Rule 14 violation – making a false written or oral report. The contract allows officers to change their official statements about a use-of-force incident after the fact, if they view video that contradicts their initial statement. Further, officers cannot be charged with a Rule 14 violation if they make inaccurate statements and are not given the opportunity to view video. The report concludes that IPRA has regularly ignored investigations of Rule 14 violations, and that this failure of oversight has “perpetuated a code of silence” within the department. Chicago FOP President Dean Angelo has called for a halt to any negotiations with the Justice Department until the Trump administration takes office. He wasn’t immediately available for comment. “Following the shocking video of the shooting death of Laquan McDonald, I wrote Attorney General Lynch urging her to open an investigation into whether the Chicago Police Department was engaged in a pattern or practice of violating constitutional and civil rights. The Justice Department’s findings are challenging, revealing serious problems that must be swiftly and responsibly addressed in order to restore trust between the police and the communities they serve. I commend Attorney General Lynch, Mayor Emanuel, and Superintendent Johnson for accepting the challenge of identifying and committing to solve these problems, and for the important changes that have already been made in recent months. I also greatly appreciate the efforts of the career Justice Department and Chicago Police Department officials who worked together cooperatively throughout this investigation and will now be charged with implementing further reforms to address the investigation’s findings. “Today is an important milestone for the City. It is our hope that today, we will show the nation and the world that we can accept critical feedback with grace and a fervent commitment to change. The city of Chicago and U.S. Department of Justice say they will continue to negotiate on reforms in the waning days of the Obama administration, before next Friday’s inauguration of Trump. Jan. 12: Friday morning the U.S. Department of Justice makes public the results of its yearlong investigation into the Chicago Police Department. It is said to be sharply critical. Jan. 11: Kim Foxx is the first African-American woman to hold the position of Cook County State’s Attorney. She joins host Carol Marin to discuss her plans for the office. Jan. 5: The incoming Trump administration has signaled a different direction with its policies on policing and civil rights. Does that mean Chicago may not have to comply with this report?